The front panels are almost done. It’s been slow going as I work a row here and there. I also got to the armhole shaping before I realised I’d forgotten to make a buttonhole. Instead of ripping it out I’ve just decided two buttons will have to do. I don’t think it’ll make much of a difference in the end. I like knitting up the front panels together, but you really need to pay attention to each step or mistakes can be made (like my missing buttonhole). 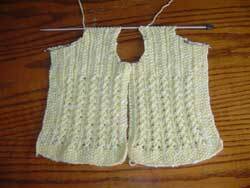 When I knit from a pattern it’s a mistake when it’s my own design it’s a ‘design adjustment’. I’ve been out learning to drive and finding it nerve racking. I need to be out on the road a lot and often to get over my fears. I’m excited by the idea of being able to drive, but I’m nervous about actually driving. So wish me luck and maybe stay off the road if you live in my area.